Making Besan ladoo in the microwave is really easy and quick. We don't have to keep stirring vigorously, till our arm starts paining. This is my and my daughter's favorite type of ladoo .Now we can make this in few minutes and eat whenever we carve for it. 1.Mix chick pea flour / Besan and melted ghee together in a microwave safe bowl. Microwave on high for 4 minutes (Time may vary depending on your Microwave). 2.Keep stirring in between after every minute.Once after the first 3 mins be sure to check it for every 30 secs. 3.At the end of 4 minutes, the mixture will be a nice reddish brown and will have a nice aroma to it. The mixture should not dry like powder, otherwise the ladoos will not hold up their shape. Let it cool completely. 4. Once cooled, add the powdered sugar, cardamom powder and cashews/raisins. Mix well and make small round ladoos . 1) If you are not able to form nice shaped ladoos then it means the ghee is not sufficient .So just heat some ghee and add to the mixture. 2) You can replace ghee with unsalted butter too. ladoos looks cute n yummy..
Nice to see my favorite ladoo after a long time. I have another question. I understand this is a microwave topic but I don't have one here in Cochin.However, I would like to try this without a microwave. 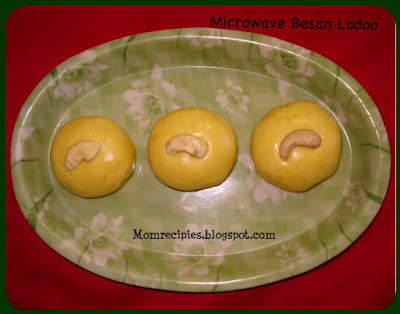 My question is that if we will heat besan with ghee and keep it to cool, then will it form into round shapes later. I remember my mother saying that we need to make it when it is hot to get the bonding between the mixture. For these ladoos after cooling only we have to add powdered sugar and form small ladoos. Other ladoos like rava ladoos and coconut ladoos etc are made when it is hot to get the bonding .